This past weekend, JY&MY came over for a movie night to watch “Chronicle” at ours, and for some reason I felt inspired to emulate a sports bar experience: eating nachos and potato skins while watching something on a big screen. These were not to be any normal nachos, oh no. 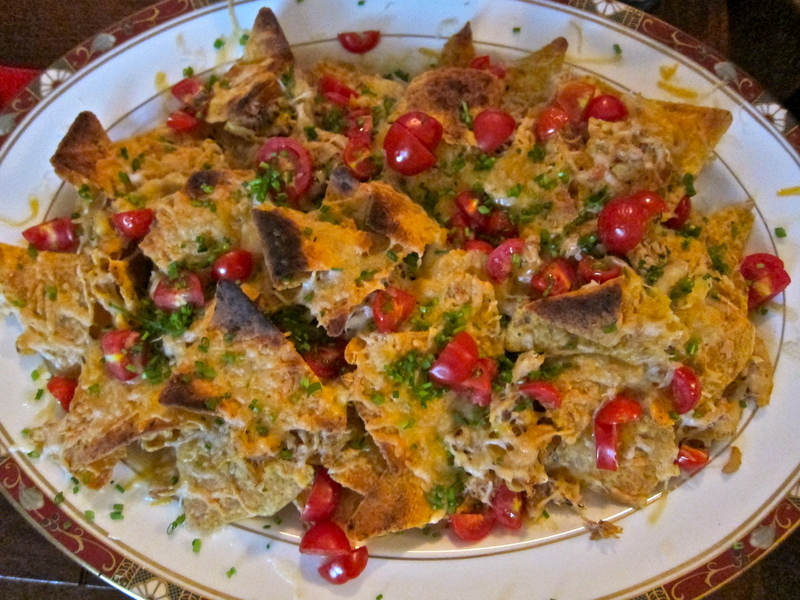 I had a tub of crabmeat in my fridge, and I intended to use it liberally – gourmet nachos, if you will. You will not believe how hard it is to find plain corn nachos in Hong Kong until you try it yourself! Forget the 5 supermarkets/stores that I tried (even GrEAT) and go straight to Oliver’s – at least I know now that they are sold there. We laid a layer of nacho chips on the platter, then chili crabmeat (seasoned with salt, pepper, chili powder and a dash of tabasco sauce, then pan-fried lightly), and a mix of grated cheddar and monterey jack cheese. On top of the third and final layer, sprinkle a final large helping of cheese (I believe we had a 250g bag, and almost 2/3 of it went on the nachos). I put my nachos under the grill, but JY suggested that next time we bung it in the microwave instead, so that the cheese doesn’t go too dry, and the nachos don’t burn before the lower tiers of cheese melt. Next time! The nachos were quite glam, and to top off the whole experience we opened the bottle of Ruinart Rosé champagne that JY & MY treated us to, thanks guys! 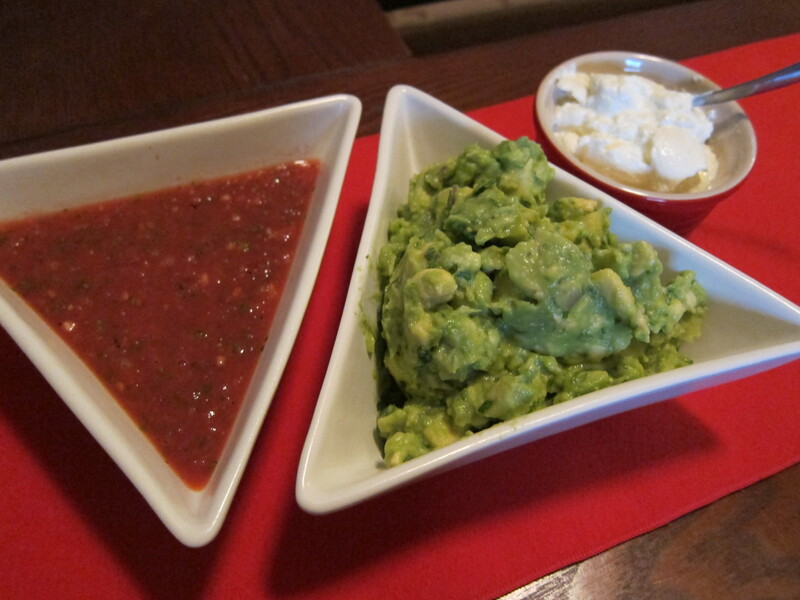 For the sauces, we put together my usual guacamole recipe minus the tomatoes. We also made a pretty awesome salsa, although next time I’ll blitz everything but the tomatoes, then add it to the tomatoes and mash them by hand so the sauce is more chunky. In a food processor, pulse all of the ingredients to the desired consistency. 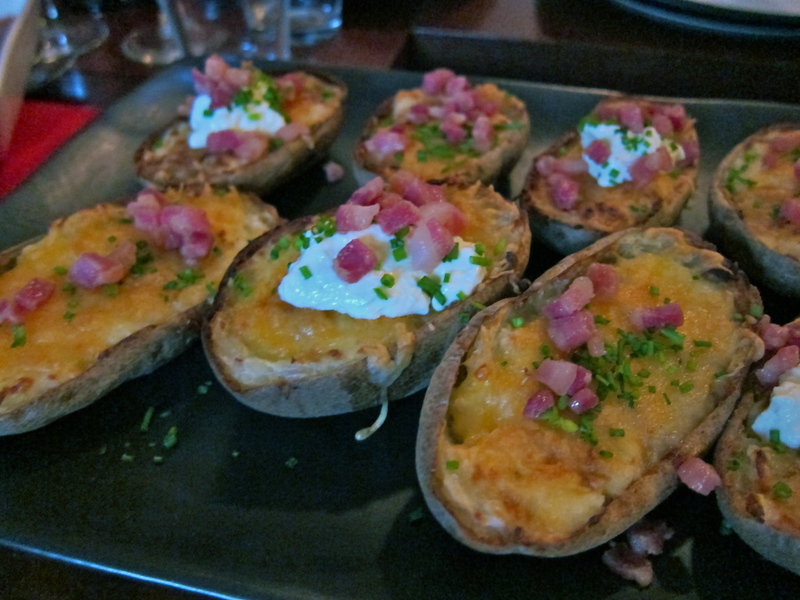 Potato skins have always reminded me of meals in Dan Ryan’s with my dad and my brother, a favorite destination when we were kids, and even now when we fancy a bit of nostalgia. This was my desired effect when I thought to make these, and I was so happy when MY said “wow, potato skins always make me think of Dan Ryan’s…”. Mission accomplished! ♥ Preheat the oven to 200°C. Wash and scrub the potatoes. Prick them all over, then bake in the oven for 1 1/2 hours, or until crispy and dry on the outside. The recipe recommended that this be done the day before, but doing at 5pm for an 8pm dinner worked just fine. ♥ Remove the potatoes from the oven and as soon as you can handle them, cut them in half and scoop out the flesh into a separate bowl and let cool. Place the skins on a baking tray until ready to use. ♥ Add the sour cream, half of the cheese, the spring onions, and the worcestershire sauce to the potato, season with salt and pepper. ♥ Spoon the filling back into the skins, then sprinkle with cheese. Pop them back in the oven for 20-30 minutes, or if you’re in a rush, switch the oven to grill and broil them for 5 minutes until melted and turning a delicious golden colour. Make sure to watch them so they don’t burn! ♥ Meanwhile, fry the pancetta or bacon until crispy and rest on kitchen paper to soak up the oil. Once out of the oven, load up those babies with bacon, spoon a dollop of sour cream on top, sprinkle with chives and eat immediately! 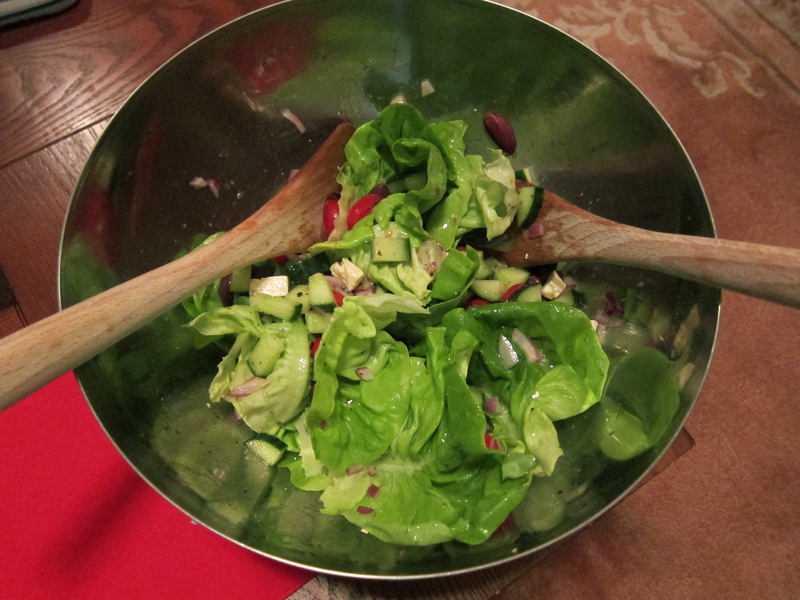 After all the cheese and carbs, there’s nothing like a modified Greek Salad to make you feel like you’re eating healthily! We settled down to watch Chronicle (good movie, by the way! ), and it was quite the perfect way to spend a lazy Saturday night with friends. 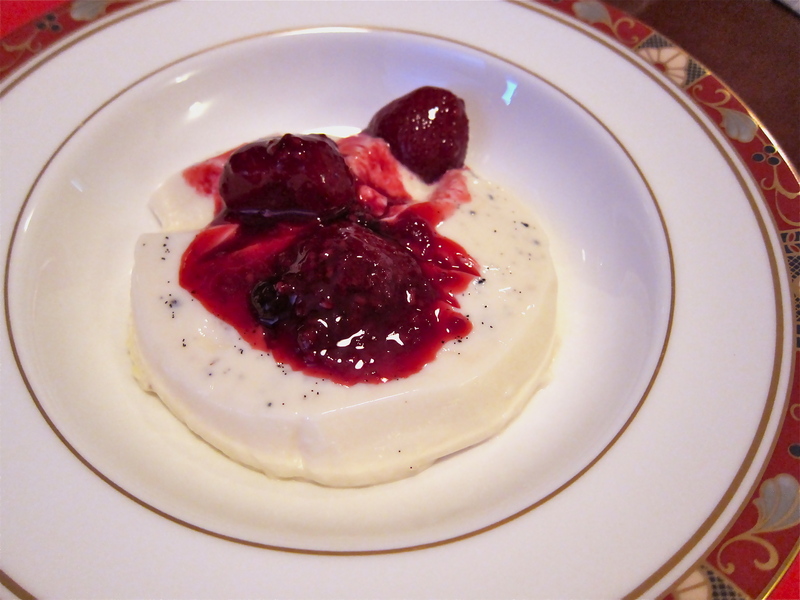 For dessert I attempted to make panna cotta with a mixed berry compote, but the panna cotta ended up looking more like a panna cotta blob – not enough gelatin! I’m going to perfect this recipe before I write it up! ♥Heat all of the ingredients on low heat in a saucepan until the sugar has dissolved, and the sauce has reduced to a slightly thicker consistency, about 15 minutes.